Just in time for Valentine’s Day (but part of the core collection), Charbonnel et Walker have brought another delightfully sweet truffle to the UK. Being chocolatiers to the Queen, they have to be very careful about formulation of new flavours and ensure that they are balanced well and have mass appeal and given how many of you ask me to review more white chocolate, I think they are on to a winner here. 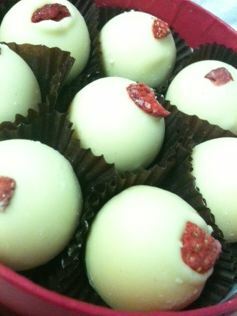 White chocolate is sweet and strawberries marry well with sweet as they can be a bit tart. The white chocolate always makes me think of cream when paired with strawberries – like the summer favourite but available any time in chocolate. Now, of course, any truffle that is just while chocolate is going to be a bit too sweet and the vanilla that is often added to while chocolate is going to be a bit pronounced and that would ruin the strawberry. 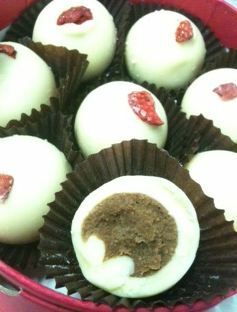 The inside isn’t white chocolate though which is a good thing – if difficult.